Nellie's Needles: Happy May Day! It's finished except for the hand-stitching of sleeves and pockets for the hanging apparatus. I like the contrast of the dry ashy colors in the border with the warm ones in the coming to life area. The contrast of scale between the border print and the trillium patch, as well as the contrast of the clean edge on the outside versus the fuzzy organic around the focal piece pleases me, too. It's delightful Nellie and full of spring sunshine. I love the textured edging of the central piece - you must be very pleased with it. Like the contrast too. An excellent piece Nellie! Terrific finish for a really lovely little quilt! 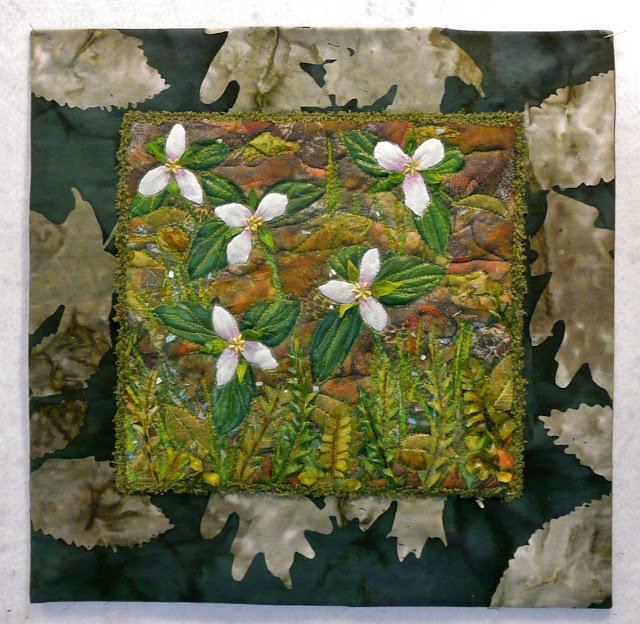 The background fabric reminds me of the pond in my yard - it is exactly what it looks like when leafs float on the surface. The trilliums are just starting to bloom here!